Oakley's Terminal Muskogee is strategically located at the confluence of the Arkansas, Grand, and Verdigris Rivers in the Port of Muskogee. There is a foreign trade zone available to our customers. The Port has excellent rail access, as well as convenient access to two major highways: to the north and south, the Muskogee Turnpike; and to the east and west, I-40. For customers desiring year round shipments of steel, bulk commodities, or raw products, ice-free Oakley's Terminal Muskogee offers major advantages in material logistics control, decades of leadership experience tailoring all capabilities and available resources to our customers' scheduling, equipment, and operational needs. The Terminal has extensive capacity for barge, rail and truck shipping and receiving of commodities. Oakley's Terminal Muskogee handles large volumes of bulk and break bulk commodities, including containers, steel pipe, coil, plate, beam, sand, salt, coal, coke, fertilizer, grain, paper, scrap, glass and ore clays served by Union Pacific Rail Road. Paragon Industries also occupies a 20000 sq. ft. building on the property that houses a state of the art steel coil facility that is capable of slitting coils up to 72" wide and ½" thick. 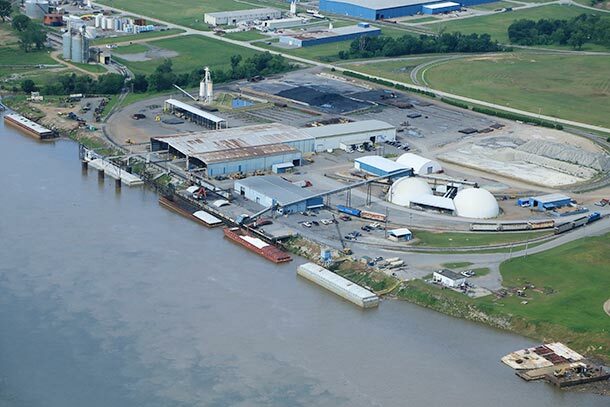 Oakley’s Port 33 and Oakley's Terminal Muskogee continue to expand as more shippers discover the economics of water transportation. This discovery, combined with Oakley’s facilities and commitment to customer satisfaction will continue to provide growth opportunities.